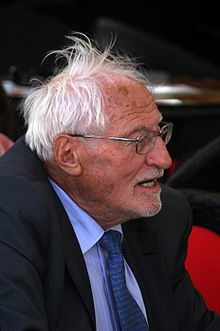 Tone Pavček (1928-2011), born in Šentjur near Novo Mesto, was a celebrated children’s poet, translator, editor and intellectual. Finishing his secondary education, he graduated from a law school in 1953. Alongside his many artistic merits, he was an editor of RTV Slovenia, director of the Youth Theatre in Ljubljana, editor-in-chief of the Cankarjeva Založba publishing house and president of the Slovene Writers’ Association. Tone Pavček translated 20th-century Russian poetry as well as contemporary and children’s poetry from a variety of Slavic languages. In 1989 he read the second May Declaration and championed for Slovene independence. In 1996 he was named a UNICEF ambassador, and in 2001 a member of the Slovenian Academy of Sciences and Arts. In 2009 he received the Golden Order of Freedom from the Republic of Slovenia for his contributions to the independence programme. Tone Pavček authored over 20 works for children, most popular among them Juri Muri iz Afrike ( Juri Muri in Africa, 1958). His children’s poetry books were translated into Russian, Serbian, Czech, Macedonian, Croatian, Georgian and Azerbaijani. In his lifetime he received a range of outstanding decorations, among these the national Levstik Award on three separate occasions (1958, 1961, 2003), the Prešeren Foundation Award (1965), the Sovre Prize (1979), and the Grand Prešeren Award (1984).